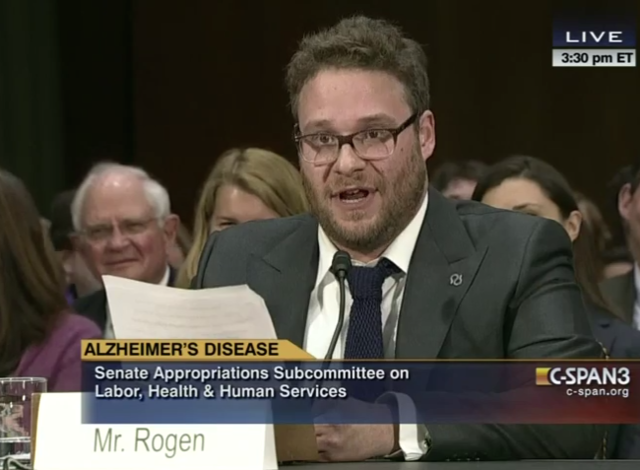 On Wednesday, February 26, actor Seth Rogen appeared before a Senate Subcommittee in Washington, D.C. to share his personal experience with Alzheimer’s disease and to make an impassioned plea for more Alzheimer’s research funding, as well as more awareness about the diease. Rogen delivered a sincere and moving speech that was punctuated by his own distinctive brand of comedy, but which focused primarily on the devastating emotional and physical effects of Alzheimer’s as he witnessed, first hand, when his mother-in-law was diagnosed with early-onset Alzheimer’s in her mid-50s. Rogen admitted that before his wife’s mother began to suffer from the disease, he thought of Alzheimer’s only in the way he’d seen in movies - people “wearing mismatched shoes and asking the same question over and over again.” The reality, he found, was infinitely more heartbreaking though. Calling it the “real ugly truth” of Alzheimer’s, Rogen described watching his mother-in-law, a teacher for 35 years, forget her loved ones, her family, how to use the bathroom, how to feed herself, and how to speak. He spoke of the shame and stigma felt by those whose family members suffer from the disease. Rogen also spoke about his new charitable organization, Hilarity for Charity, which is working with the Alzheimer’s Association to raise money both for families struggling with Alzheimer’s and for cutting edge research. Hilarity for Charity also recently started a college program that allows university students to get involved with the group and hold campus events to promote Alzheimer’s awareness among their classmates. Currently over five million Americans suffer from Alzheimer’s disease and that number is expected to rise to over 16 million within 35 years as our aging population grows. And while research is ongoing, Rogen is right to point out there is still a stigma associated with Alzheimer’s that keeps it out of public conversation. It is important to see an actor as young as Rogen taking the initiative to bring Alzheimer’s back into public conversation, and for him to emphasize the personal and emotional effects of the disease on both its victim and their friends and family. We see these effects first hand all the time as we help support families dealing with Alzheimer’s and commend Rogen for taking such a proactive stance.